The Miracle of Crocodile Flats (Umuzi, 2012) is an affectionate satire set in a platteland village. When Ma-Jesu appears to a young schoolgirl, the sighting gives rise to an onslaught of curious pilgrims, mercenary journalists and even a representative of the Vatican, and inspires varying reactions from the townsfolk, with any taking advantage of the business opportunity presented. What makes the apparition significant is that this Mary is “brown like us”. With wry humour, the author exposes the hypocrisy, corruption and absurdity inherent in formalised religion, balancing this with flashes of its more benign side, such as its ability to unite and bring solace. Godforsaken Crocodile Flats is the last place on earth where you’d expect any marvel, so when Sweetness Moloi believes she saw the Virgin Mary there – all nice and brown like real people – who’s going to believe her? But lo, the good news spreads like wildfire, and soon all hell breaks loose. Every sect and faction want in on the action, there is fierce competition for the elusive glory, and hordes of journalists, pilgrims, and the just plain curious flock the troublesome village. In this small corner of the Rainbow Nation, so desperately in need of a miracle, jealousy tumbles over hyprocisy to end up – miraculously – in a state of grace. Reading Matters – 22 March 2012 – Sue Grant-Marshall (Host): Guest, Jenny Hobbs about her new book The Miracle of Crocodile Flats. 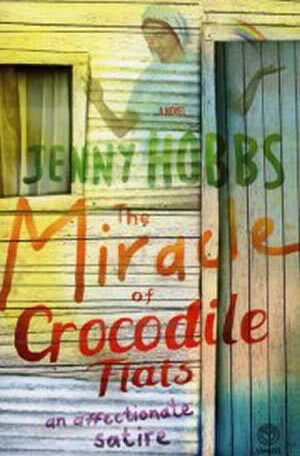 Sue Grant-Marshall chatted to Jenny Hobbs about her new book The Miracle of Crocodile Flats and about the Franschhoek Literary festival.